Schematic drawing of collision between two BECs (the gray blobs) that have been “dressed” by laser light (brown arrows) and an additional magnetic field (green arrow). The fuzzy halo shows where atoms have been scattered. The non-uniform projection of the scattering halo on the graph beneath indicates the presence of effective d-wave and g-wave scattering. PFC research at the Joint Quantum Institute (JQI) has for the first time engineered and detected the presence of effective high angular momentum collisions between atoms at temperatures close to absolute zero. 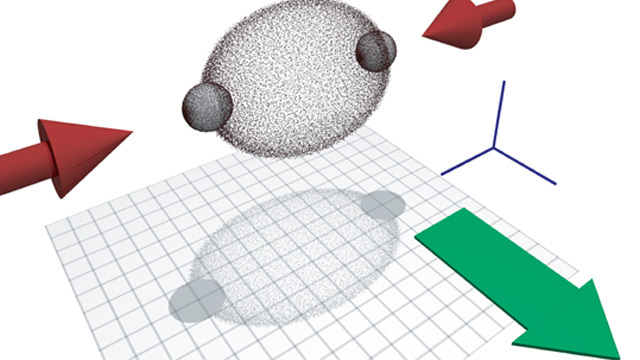 Previous experiments with ultracold atoms featured essentially head-on collisions. The JQI experiment, conducted at NIST, is able to create more complicated (higher partial-wave) collisions between atoms using only lasers. The key to the approach is to alter the atoms’ environment with laser light. They “dress” rubidium atoms by bathing them in a pair of laser beams, which force the atoms to exist in a superposition of spin and momentum states. Previously, ultralow-temperature collisions have mostly been s-wave scattering, in which two atoms scatter off each other (back to back) at any and all angles. This work is the first to create conditions in which effective d-wave and g-wave scattering modes in an ultracold experiment could be seen. Use of dressed atoms may facilitate the creation of exotic quantum states that can be exploited for practical applications like quantum computing and for carrying out experiments exploring effects associated with condensed matter, such as superconductivity, superfluids, the quantum Hall effect, and topological insulators, and for searching for things that haven’t yet been observed, such as the “Majorana” fermions.